Increasing FDI in industries such as Oil & Gas, chemical, and petrochemical, growth in pipeline network, and increasing number of small & medium manufacturers are some of the key factors driving India industrial valves market forecast revenues. In India, industrial valves market grew significantly over the last three years owing to increasing industrial application and government focus towards expanding pipeline infrastructure for natural gas distribution. According to 6Wresearch, India industrial valves market size is projected to reach $3.0 billion by 2023. In the coming years, industrial valves market is expected to post significant growth, attributed to new industrial infrastructure development projects, repair & renovation of existing industries, and expansion in the gas pipeline network. Oil & Gas application sector captured majority of India Industrial Valves Market share in 2016, followed by Power and Petrochemical, Chemical & Fertilizers (PCF); this was primarily driven by rising industrial valves application in Oil & Gas- downstream sector. With 21 refineries, India is one of the largest countries that accounts for major refineries, which creates several opportunities for valve manufacturers. Also, with upcoming projects such as exploration of Oil & Gas in Gujarat by GAIL is likely to post growth in industrial valves market over the coming years. The India industrial valves market report thoroughly covers industrial valve market by valve technology, type, and application. 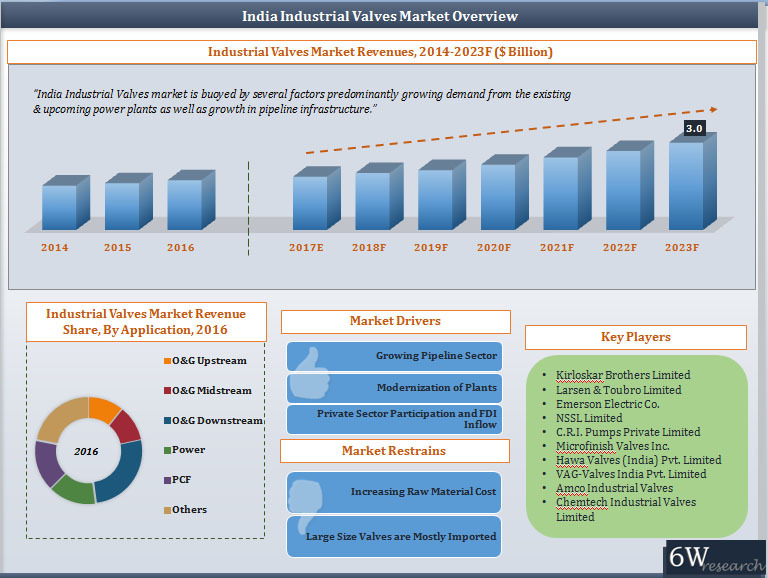 The India industrial valves market outlook report provides an unbiased and detailed analysis of the on-going India industrial valves market trends, opportunities/ high growth areas, market drivers, which would help the stakeholders to decide and align their market strategies according to the current and future market dynamics. 11.7	Hawa Valves (India) Pvt. Ltd.
11.8	VAG-Valves India Pvt. Ltd.